To determine the effects of nitrous oxide (N2O) on the speed and quality of the uptake process of sevoflurane during inhalation induction in adult patients. For randomized controlled study, eighty-four American Society of Anesthesiologists I-II patients undergoing gynecological interventions were randomly assigned to receive an 8% sevoflurane mixture with either 67% N2O plus 33% oxygen [Group sevoflurane and nitrous oxide (SA)] or 100% oxygen only [Group sevoflurane (S)]. Both groups were induced by a single-breath induction. End-tidal and inspiratory concentrations of respiratory and anesthetic gasses were continuously assessed during induction as well as time to loss of eyelash reflex, time to cessation of eye movements, and time to initiation of spontaneous breaths. Patients were intubated by the 5th minute of induction and their vital signs, bispectral indexes, reflex responses to intubation and additional drug requirements for intubation were also recorded. End-tidal sevoflurane concentrations and the ratio of alveolar to inspiratory sevoflurane concentrations (FA/Fi) of patients in group SA recorded at the 2nd, the third and the 5th minute of induction showed statistically significant increases when compared with patients in group S. Time to loss of eyelash reflex and time to cessation of eye movements were found to be decreased in group SA by 25 and 13%, respectively. Patients who presented with a reflex response to intubation in group S exceeded patients in group SA by 38.8% and patients who required additional medication for intubation in group S exceeded patients in group SA by 28.6%. The findings of this study support the view that administration of N2O improves the rate and quality of mask induction with sevoflurane. The benefits provided by N2O attributable to the concentrating and second gas effects appear during the first few minutes of induction (2nd, 3rd, and 4th minutes) as well as during intubation when sevoflurane is used for mask induction. Nitrous oxide (N2O) is frequently used during mask induction. It was reported that the addition of N2O during induction was beneficial due to the concentration and second gas effects (1-3). The second gas effect of N2O was identified for the first time in the study conducted by Epstein et al. (1). Besides, the second gas effect has also been shown in the studies performed with mask induction in children. The addition of N2O to induction in children has been demonstrated to be beneficial in numerous studies (2-4). However, in adults, this situation has not been clearly demonstrated, and there are also publications reporting that it was not useful (5-7). We designed this study to investigate the speed and quality of the uptake process of sevoflurane when administered together with N2O during inhalation induction in adults. Eighty-four American Society of Anesthesiologists (ASA) I-II female patients who were planned to undergo gynecological interventions were included in the study following approval of the Adnan Menderes University Medical Faculty Ethics Committee (decision 1, protocol number: 00008, chairman: Prof. Dr. U. Katkıcı, date of approval on 10 January 2002) and obtaining the informed consents of the patients. The patients were informed about the workup during the preoperative evaluation and the anesthesia induction with the single-breath technique. Patients who were planned to undergo emergency operation, who were under 20 or over 60 years of age, who had cardiac problems and arterial hypertension [systolic arterial blood pressure (SAP) above 160 mmHg, diastolic arterial blood pressure (DAP) above 100 mmHg], hypotensive patients (SAP below 90 mmHg), who had bleeding diathesis, who were mentally retarded and uncooperative, who had stated that she could not hold her breath, who were claustrophobic, and who were considered to encounter ventilation difficulties during mask ventilation were excluded from the study. Midazolam intramuscular injection was administered at a dose of 0.07 mg/kg 30 minutes before the operation in all patients for premedication. Patients were taken to the operating room following insertion of the intravenous line at the dorsum of the left hand with a 20G cannula. Monitoring of electrocardiography (DII lead), heart rate (HR), noninvasive arterial pressure, tissue oxygen saturation (SpO2), and anesthetic gasses were performed by using Datex Engstrom AS/3 (Helsinki, Finland) anesthesia device and monitor. Anesthetic gas monitoring was performed by the infrared spectrometry method (sidestream method) on both the inspiration and expiration. Datex Engstrom AS/3 (Helsinki, Finland) anesthesia device, anesthesia circuit, 2L anesthesia balloon, and face mask suitable for the patient’s face were used during the study. A respiratory gas measurement line (capnometer line) was placed over the mask for gas measurements during the ventilation of the patient. Patients were divided into two groups according to the induction method that would be used by tossing a coin for each patient; the group in which sevoflurane and N2O would be used in combination (group SA, n=44) and the group that only sevoflurane would be utilized (group S, n=40). The system was filled with 8% sevoflurane, 67% N2O (4 L/min), 33% oxygen (2 L/min) in group SA and with 8% sevoflurane and 100% oxygen (6 L/min) in group S. The system was considered ready when Fi sevoflurane was read as 8% on the anesthesia monitor. While the system was being filled, the patient was requested to perform vital-capacity breathing twice in the room air (a deep breathing exercise). HR, SAP, DAP, mean arterial pressure (MAP) SpO2, and bispectral index (BIS) values were recorded before initiation of anesthesia. The anesthesia mask was placed on the patient’s face so as not to leak, and the chronometer was started. The patient was requested to take and hold a deep breath. After placement of the face mask, the eyelash reflex disappearing time (ERDT) and the time for the eyes to be fixed at the midline were checked at 10-second intervals and recorded. The apnea periods were recorded. When the spontaneous breathing of the patients started, their respirations were supported as the end-tidal carbon dioxide (ETCO2) value would be 35-40 mmHg. The patients whose breathing had not returned within 90 seconds were ventilated by mask and anesthesia balloon as their ETCO2 would be 35-40 mmHg. HR, SAP, DAP, MAP, SpO2, the oxygen concentration in the inspiratory air, the nitrous oxide concentration in the inspiratory air (FiN2O), the sevoflurane concentration in the inspiratory air (Fisev), end-tidal oxygen concentration (ETO2), end-tidal nitrous oxide, end-tidal sevoflurane (ETsev), ETCO2 and BIS values were recorded at 1-minute intervals. Both patient groups were ventilated for five minutes with gas concentrations specific to their group. At the fifth minute, the patients were intubated with 7.5 mm ID endotracheal tube. The reflex responses to intubation and the requirement for additional medication during intubation were recorded. An increase of more than 10% in HR and MAP over the latest measurement, together with movements and straining during intubation were considered as the reflex response to intubation. When this reaction was present, one microgram/kg i.v. Fentanyl was administered to the patient. If the response was not suppressed despite such a fentanyl dose, lidocaine 1.5 mg/kg i.v. was administered together with fentanyl one microgram/kg. Intravenous muscle relaxant (vecuronium 0.1 mg/kg) was administered to the patients encountering bronchospasm during or after intubation. Other drugs required and administered following the first intubation were recorded as the additional medications for intubation. Statistical analysis was performed by the “SPSS 9.0 for Windows (SPSS Inc., Chicago, Illinois) software package. The “a priori” calculations with G*Power 3, based on the data of the pilot study that we conducted at the beginning of the study, revealed that the number of the patients should be 64 in order to accurately identify the 10% difference in ETsev concentration (power of the study 90%) at two minutes between the two groups. The number of subjects was calculated to be at least 40 to be able to accurately identify the 30% difference in ERDT (the power of the study 90%). Eighty-four ASA I-II female patients who were scheduled to undergo gynecological intervention were included in the study. However, ventricular extrasystole with a 2:1 response developed in one patient and bronchospasm in another. Mask induction could not be performed due to the fall of the SpO2 level below 90% in one patient, and due to the development of the cough reflex in another. These four patients, who were in the group that sevoflurane was administered only, were excluded from the study and necessary interventions were made. No statistically significant differences were determined between the patient groups with regard to age and body mass index (p>0.05) (Table 1). Significant differences were found between the groups with regard to ERDT and the time for the eyes to be fixed at the midline (p<0.01). While the ERD in 59.9±25.8 seconds in group SA, it disappeared in 78.0±24.1 seconds in group S. The time for the eyes to be fixed at the midline was 207.3±52 seconds in group SA, whereas it was determined as 236.9±43.5 seconds in group S (p<0.01). No statistically significant difference was found between the groups regarding the duration of apnea (p>0.05) (Figure 1). 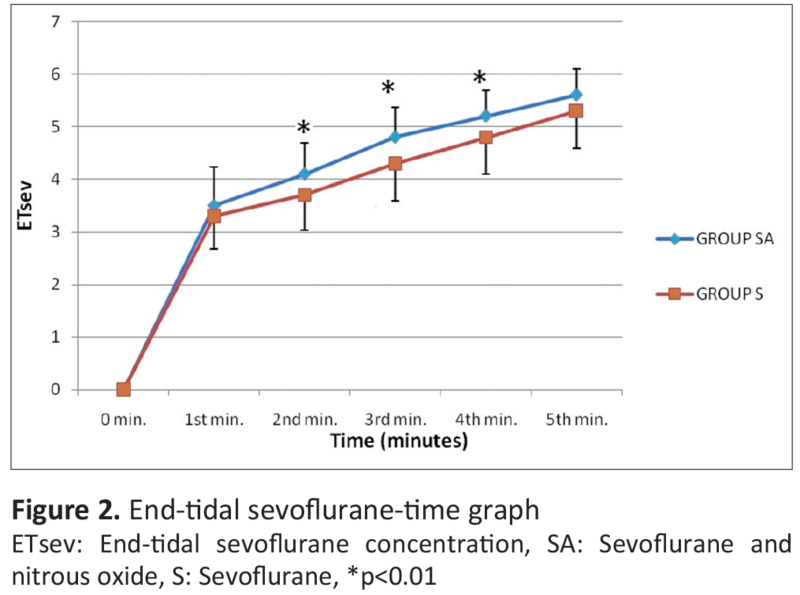 The ET concentrations of sevoflurane were 3.5±0.74% in group SA, and 3.3±0.62% in group S at the 1st minute, 4.1±0.59% in group SA and 3.7±0.67% at the 2nd minute, 4.8±0.56% in group SA and 4.3±0.71% in group S at the 3rd minute, 5.2±0.48% in group SA and 4.8±0.71% in group S at the 4th minute, 5.8±0.5% in group SA and 5.3±0.72 in group S at the 5th minute. Although there were differences in favor of group SA at the first and fifth minutes, there was no statistically significant difference between the two groups regarding the sevoflurane values (p>0.05). However, significant differences were found on the 2nd, 3rd, and 4th minutes between the two groups regarding ETsev values (p<0.01) (Figure 2). Similar results with the ETsev comparisons were obtained when the minute FA/Fi measurements of sevoflurane were compared between the groups (ETsev concentrations were considered as FAsev). Statistically significant increases in FA/Fi values were determined at the 2nd, 3rd, and 4th minutes, when the N2O added group was compared to the group that it was not supplemented, (p<0.01). These values were higher in the N2O-supplemented group at the first and 5th minutes, although not statistically significant (p>0.05) (Figure 3). No statistically significant difference was found between the two groups regarding the BIS values (p>0.05) (Table 2). Data were shown as the mean ± standard deviation. 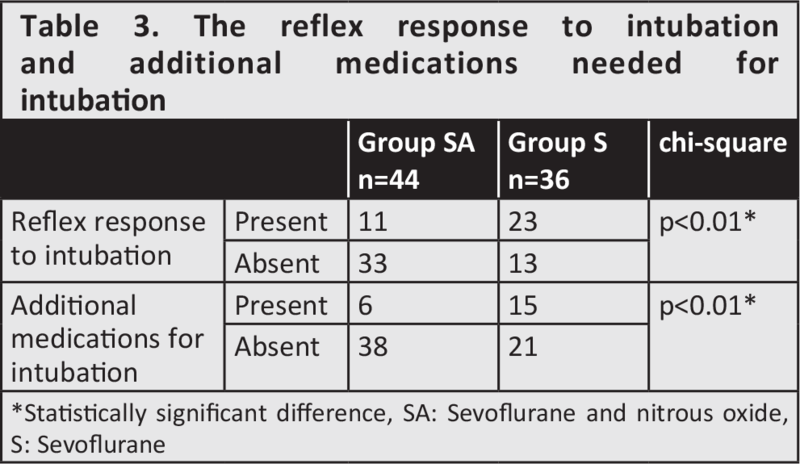 There were statistically significant differences between the two groups in favor of group SA regarding the reflex response to intubation and additional medication needed for intubation (p<0.01) (Table 3). There were no significant differences between the two groups regarding HR, SAP, MAP, and SPO2 values. These values were observed to be stable. In this study, it was determined that the addition of N2O to the single-breath induction with sevoflurane had accelerated the anesthesia induction, had shortened the duration to reach the surgical anesthesia stage and had facilitated endotracheal intubation without administering muscle relaxant. 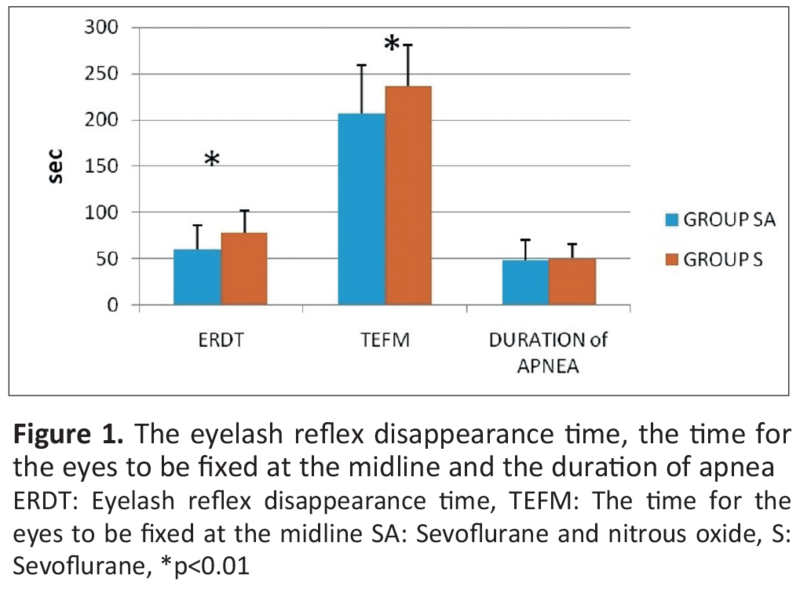 In the N2O-added group, the eyelash reflex disappearance time and the duration for the eyes to come to the midline were determined to be reduced by 25% and 13%, respectively. Muzi et al. (8), in the study that they conducted in adults, found a similar result for ERDT. Yurino et al. (9) determined that nitrous oxide had shortened the induction time by 15%; however, they were not able to prove this statistically. Hall et al. (10) suggested that the addition of nitrous oxide does not shorten the durations regarding the disappearance of eyelash reflex and the relaxation of the jaw; they claimed that it reduced the excitatory response only. Lee et al. (2) determined significant results related to the eyelash reflex disappearance time in the study that they had carried out in children with single-breath induction. 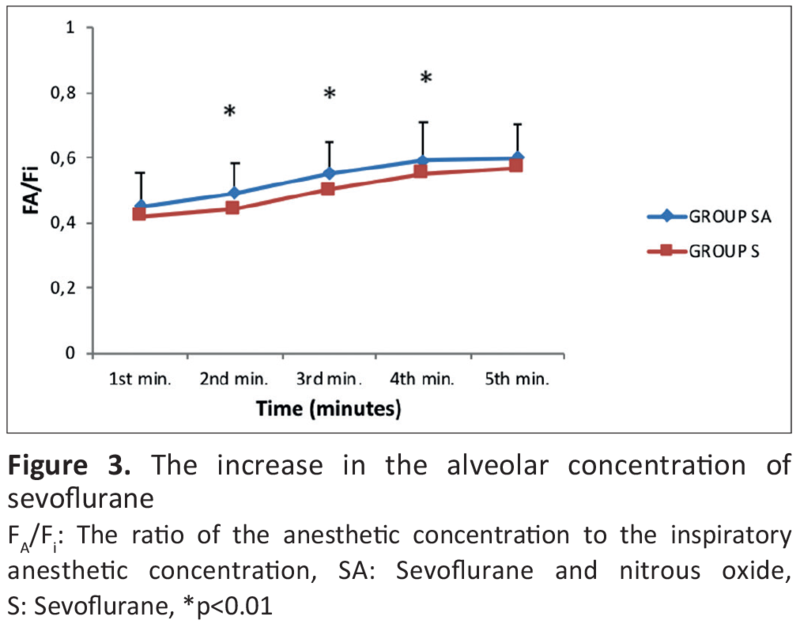 The ETsev concentrations of sevoflurane and the FA/Fi ratios were determined to be 6.3% higher in average at the 2nd, 3rd, and 4th minutes in the nitrous oxide added group. The elevation of the ETsev concentration in a shorter time with the addition of nitrous oxide gave us the impression that indirectly, the anesthetic concentration in the brain had also risen more rapidly. Also, Sarner et al. (11), in their study, determined that the duration for the ETsev to reach a concentration of 2% was reduced significantly in the N2O-added group. The elevations in the FA/Fi ratios of the N2O-added group mean that the induction with sevoflurane is accelerated. The inspiratory concentration of the anesthetic substance (Fi), determines the alveolar concentration (FA), which affects the arterial concentration of the anesthetic (Fa), thus determining the concentration of the anesthetic in the brain tissue. Also, the end-tidal alveolar concentration of the anesthetic is an indicator of the anesthetic concentration in the brain (12). The second gas effect was proposed by Epstein et al. (1) and was proven in the consecutive study (13). However, in the study carried out by Sun et al. (14), it was determined that the FA/Fi ratio and arterial blood concentration did not show any difference with the addition of N2O to enflurane in the first five minutes; they claimed that the second gas effect is not a clinically valid concept. When Mutoh et al. (15) compared the dog groups in which N2O was added and was not added to sevoflurane and isoflurane, they determined that N2O had not improved the quality of mask induction and that the concentration and second gas effects had been minimal. Regarding desflurane, Taheri and Eger (16), in their study comparing 65% N2O and 5% N2O, determined that desflurane increased the FA/Fi ratio 7-8% more. Nishikawa et al. (17), in their study investigating the second gas effect of N2O on oxygen, found elevations in EtO2 and PaO2 values with N2O and claimed that this result confirmed the second gas effect. Swan et al. (18), in a similar study, determined that N2O reduced the NAC value of halothane by 40%. Dubois et al. (19) determined that the times of loss of the consciousness and movements were significantly shorter in the group with N2O. Watanabe et al. (20), determined that simultaneous administration of halothane and N2O to a single lung increased the halothane uptake rate when compared to administering to both lungs in their study in which they ventilated the lungs separately with the double-lumen tube. They described this situation as the supramaximal second gas effect. However, Lin and Wang (21) criticized the supramaximal second gas effect as a non-existent phenomenon; they claimed that the study conducted by Watanabe et al. (20) had been designed completely wrong and the data had been misinterpreted. They emphasized that comparing the single and double-lumen tubes for the administration of N2O was wrong and that the N2O administered ipsilateral lung should have been compared to the ipsilateral lung that N2O was not administered, instead. Goldman (3), in his study with mask induction in children, obtained results supporting the second gas effect of N2O, together with its concentration effects. A similar study by O’Shea et al. (22) revealed no statistically significant difference between groups regarding the induction time. However, in that study, sevoflurane mask induction was initiated at a concentration of 0.5 and was gradually increased up to a concentration of 8. We think that the number of the patients should be greater to detect a difference in induction time. Also, the concentrations of FA/Fa not been measured might have prevented us from determining the second gas and concentration effects. No statistical difference was found in the comparison of BIS values. However, lower BIS values were obtained at the 2nd, 3rd, and 4th minutes. The statistical strength of the study regarding BIS values was insufficient with these patient numbers. Further studies with increased patient numbers are needed. Also, when we look at the medical literature, numerous studies are present showing that BIS value remains unchanged (23-29). There are hypotheses that the reason of this is related to N2O changing the beta ratio in BIS (the ratio of very high beta activity to the sum of high alpha and beta activities) (23). The reflex response to intubation was found as 39% and the need for additional medications during intubation was lower by 32% in the N2O added group. We consider that this difference is related to both the accelerator effect of N2O on intubation and its strong analgesic effect. Numerous factors such as ventilation, cardiac output, lung capacities, functional residual capacity, inspiratory and expiratory anesthetic concentrations, arterial and venous blood anesthetic concentrations (Ca and Cv) have effects on the uptake of volatile agents to the body. Evaluating the second gas effect of N2O by keeping all these parameters constant is difficult. In the study of Sun et al. (14) in which they did not accept the second gas effect, the ventilation parameters were not kept constant, and the cardiac effects of N2O were ignored. The effects of N2O on the functions of the cardiovascular system are increasing the HR and arterial blood pressure mildly, and thus the cardiac output, by stimulating the sympathetic nervous system. This effect becomes even more pronounced at higher concentrations (12). Sun et al. (14) used N2O at high concentrations in their experimental group. Taheri and Eger (16), criticizing this study, stated that to prevent ventilatory differences and to keep the respiratory quotient (RQ) constant, the ventilation parameters should be adjusted so as to keep the ETCO2 concentration constant in the study groups. Since parameters related to cardiac output and respiration were not kept constant during the study conducted by Sun et al. (14), their rejection of the secondary gas effect is controversial. The investigators have stated two different points of view related to the addition of N2O to sevoflurane induction. Those who defend that it shortens the induction period have suggested that N2O accomplishes this by the second gas effect and the previously shown additive effects (11,18,19,30). The opponent group has advocated in their studies that N2O does not shorten the induction period and the addition of N2O during induction is unnecessary (9,10,22). However, in the studies representing both opinions, the excitatory and movement responses were determined to be less in the N2O added groups. In both the studies suggesting that it shortens the induction period and the studies suggesting that there was no difference, the patient ages being different (adult, child, infant), the differences of the used anesthesia systems (ring system, Mapleson A, B, D), flow differences (within the range of 3 L/min. and 10 L/min. ), in other words, the inability to provide a complete standardization regarding ventilation, cardiac output and lung capacities might be a cause of such different results. N2O was used with the recommended dose (67%) in this study. Also, the ventilation parameters were adjusted so as to keep the ETCO2 concentration constant. It was attempted to ensure that the non-constant factors affecting the uptake of the anesthetic agent would be effective equally in all study groups. The arterial concentration of the anesthetic could not be measured due to technical insufficiencies. The data in our study were supportive of the studies reporting that N2O shortened the induction period. Although N2O seemed to lose its advantage for the induction at the 5th minute, which was observed within the first three minutes, the need for more medications of the group without N2O shows that these effects of N2O can be benefited in a special and limited adult patient group in which i.v. induction cannot be performed. The results of this study showed that, with the addition of N2O, the sevoflurane induction was accelerated, and the intubation without administering muscle relaxant was facilitated, suggesting that N2O plays a significant role in the process of sevoflurane uptake to the body (second gas effect) in adults, also. Ethics Committee Approval: For this study, approval of Adnan Menderes University Medical Faculty Ethics Committee (decision 1, protocol number: 00008, chairman: Prof. Dr. U. Katkıcı, date of approval on 10 January 2002) was taken. Surgical and Medical Practice: K.V.E., Concept: K.V.E., A.G., Design: K.V.E., A.G., Data Collection or Processing: K.V.E., Analysis or Interpretation: K.V.E., F.G., Literature Search: K.V.E., A.G., I.K., Writing: K.V.E. 1. Epstein RM, Rackow H, Salanitre E, Wolf GL. Influence of the concentration effect on the uptake of anesthetic mixtures: The second gas effect. Anesthesiology 1964; 25: 364-71. 2. Lee SY, Cheng SL, Ng SB, Lim SL. Single-breath vital capacity high concentration sevoflurane induction in children: with or without nitrous oxide? Br J Anaesth 2013; 110: 81-6. 3. Goldman LJ. Anesthetic uptake of sevoflurane and nitrous oxide during an inhaled induction in children. Anesth Analg 2003; 96: 400-6. 4. Agnor RC, Sikich N, Lerman J. Single-breath vital capacity rapid inhalation induction in children: 8% sevoflurane versus 5% halothane. Anesthesiology 1998; 89: 379-84. 5. Ti LK, Pua HL, Lee TL. Single vital capacity inhalational anaesthetic induction in adults--isoflurane vs sevoflurane. Can J Anaesth 1998; 45: 949-53. 6. Peyton PJ, Horriat M, Robinson GJ, Pierce R, Thompson BR. Magnitude of the second gas effect on arterial sevoflurane partial pressure. Anesthesiology 2008; 108: 381-7. 7. Hendrickx JF, Carette R, Lemmens HJ, De Wolf AM. Large volume N2O uptake alone does not explain the second gas effect of N2O on sevoflurane during constant inspired ventilation. Br J Anaesth 2006; 96: 391-5. 8. Muzi M, Robinson BJ, Ebert TJ, O'Brien TJ. Induction of anesthesia and tracheal intubation with sevoflurane in adults. Anesthesiology 1996; 85: 536-43. 9. Yurino M, Kimura H. Comparison of induction time and characteristics between sevoflurane and sevoflurane/nitrous oxide. Acta Anaesthesiol Scand 1995; 39: 356-8. 10. Hall JE, Stewart JI, Harmer M. Single-breath inhalation induction of sevoflurane anaesthesia with and without nitrous oxide: a feasibility study in adults and comparison with an intravenous bolus of propofol. Anaesthesia 1997; 52: 410-5. 11. Sarner JB, Levine M, Davis PJ, Lerman J, Cook DR, Motoyama EK. Clinical characteristics of sevoflurane in children. A comparison with halothane. Anesthesiology 1995; 82: 38-46. 12. Morgan GE, Michael SM, Murray JM. Inhalational Anesthetics. In: Morgan GE, Michael SM, Murray JM, eds. Clinical Anesthesiology. 3 ed. New York: Lange and Mc Graw Hill; 2002: 127-50. 13. Stoelting RK, Eger EI 2nd. An additional explanation for the second gas effect: a concentrating effect. Anesthesiology 1969; 30: 273-7. 14. Sun XG, Su F, Shi YQ, Lee C. The "second gas effect" is not a valid concept. Anesth Analg 1999; 88: 188-92. 15. Mutoh T, Nishimura R, Sasaki N. Effects of nitrous oxide on mask induction of anesthesia with sevoflurane or isoflurane in dogs. Am J Vet Res 2001; 62: 1727-33. 16. Taheri S, Eger EI, 2nd. A demonstration of the concentration and second gas effects in humans anesthetized with nitrous oxide and desflurane. Anesth Analg 1999; 89: 774-80. 17. Nishikawa K, Kunimoto F, Isa Y, Miyoshi S, Takahashi K, Morita T, et al. Second gas effect of N2O on oxygen uptake. Can J Anaesth 2000; 47: 506-10. 18. Swan HD, Crawford MW, Pua HL, Stephens D, Lerman J. Additive contribution of nitrous oxide to sevoflurane minimum alveolar concentration for tracheal intubation in children. Anesthesiology 1999; 91: 667-71. 19. Dubois MC, Piat V, Constant I, Lamblin O, Murat I. Comparison of three techniques for induction of anaesthesia with sevoflurane in children. Paediatr Anaesth 1999; 9: 19-23. 20. Watanabe S, Asakura N, Taguchi N. Supramaximal second gas effect: more rapid rise of alveolar halothane concentration during ipsilateral lung N2O administration compared to bilateral administration. Anesth Analg 1993; 76: 76-9. 21. Lin CY, Wang JS. Supramaximal second gas effect--a nonexistent phenomenon. Anesth Analg 1993; 77: 870-2. 22. O'Shea H, Moultrie S, Drummond GB. Influence of nitrous oxide on induction of anaesthesia with sevoflurane. Br J Anaesth 2001; 87: 286-8. 23. Puri GD. 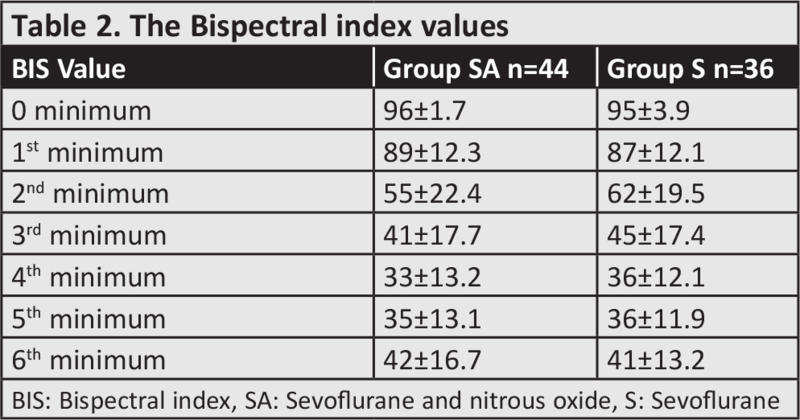 Paradoxical changes in bispectral index during nitrous oxide administration. Br J Anaesth 2001; 86: 141-2. 24. Barr G, Jakobsson JG, Owall A, Anderson RE. Nitrous oxide does not alter bispectral index: study with nitrous oxide as sole agent and as an adjunct to i.v. anaesthesia. Br J Anaesth 1999; 82: 827-30. 25. Porkkala T, Jantti V, Kaukinen S, Hakkinen V. Nitrous oxide has different effects on the EEG and somatosensory evoked potentials during isoflurane anaesthesia in patients. Acta Anaesthesiol Scand 1997; 41: 497-501. 26. Yli-Hankala A, Lindgren L, Porkkala T, Jantti V. Nitrous oxide-mediated activation of the EEG during isoflurane anaesthesia in patients. Br J Anaesth 1993; 70: 54-7. 27. Ropcke H, Schwilden H. Interaction of isoflurane and nitrous oxide combinations similar for median electroencephalographic frequency and clinical anesthesia. Anesthesiology 1996; 84: 782-8. 28. Sebel PS, Lang E, Rampil IJ, White PF, Cork R, Jopling M, et al. A multicenter study of bispectral electroencephalogram analysis for monitoring anesthetic effect. Anesth Analg 1997; 84: 891-9. 29. Rampil IJ, Kim JS, Lenhardt R, Negishi C, Sessler DI. Bispectral EEG index during nitrous oxide administration. Anesthesiology 1998; 89: 671-7. 30. Sivalingam P, Kandasamy R, Dhakshinamoorthi P, Madhavan G. Tracheal intubation without muscle relaxant--a technique using sevoflurane vital capacity induction and alfentanil. Anaesth Intensive Care 2001; 29: 383-7.